In 1978, Kim "Howard" Johnson ran away to join the circus - Monty Python's Flying Circus, that is. 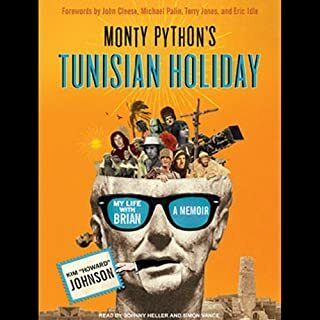 The Pythons converged on Tunisia to film their timeless classic Life of Brian, and Howard found himself in the thick of it, doubling for nearly all the Pythons, playing more roles in the film than John Cleese, and managing to ruin only one shot. He became the unit journalist, substitute still photographer, Roman soldier, peasant, near-stalker, and, ultimately, friend and confidant of the comedy legends. No I would not. This isn't really a story, but more of a journal of a man's personal day, and not one of the python's day, just a random guy's day. If you wrote a book about your spring break vacation with your friends, it would be about as interesting. I laughed once and don't think I even smiled after that. He stresses that the work of making a movie is very tedious, and his book reflects that. I'll admit that I gave up after 2 1/2 hours, and maybe some day I'll try it again, but I can't imagine that they would have wasted the first 1/2 of a book only to make the next half suddenly more interesting. Would you ever listen to anything by Kim "Howard" Johnson again? What does Johnny Heller and Simon Vance bring to the story that you wouldn’t experience if you just read the book? The narrators actually do some pretty great impressions and are by the best part of the book.